Toys and CollectiblesAction figures, statues, exclusives, and other merchandise. Beware: if you look here, you’re probably going to spend some money afterwards. As one of the few superheroes without any powers, Tony Stark instead brings some impressive toys to battle—including the towering Hulkbuster armor—that must make other heroes jealous. 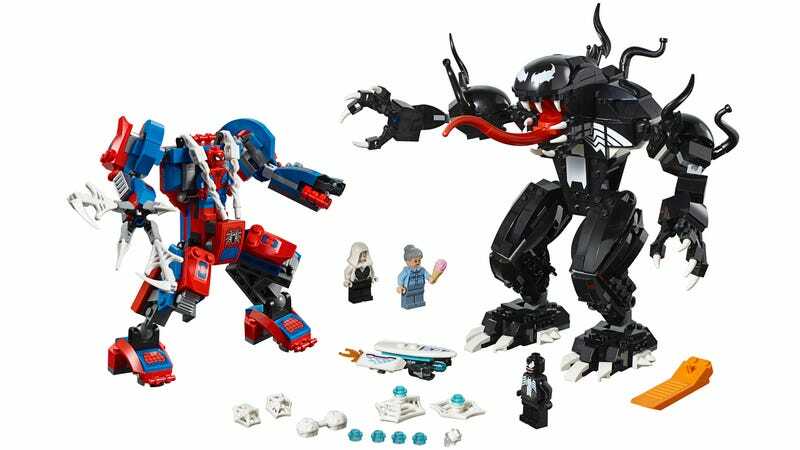 But as io9 can exclusively reveal today, in Lego’s new set, Spider-Man and Venom have no reason to envy Stark, as the two will soon go toe-to-toe in their very own giant mechs. The new 604-piece, $50 set will be on display at Lego’s booth at San Diego Comic-Con this week, but it won’t actually go on sale until later this year, on December 1. That’s a bit of a bummer, as no collector likes having to wait to expand their hoard, but in addition to minifigure versions of Spider-Man and Venom piloting their articulated giant robots, the set also comes with minifigure versions of Ghost Spider (aka Spider-Gwen) with her hoverboard, and Aunt May trying to de-escalate everyone with a tasty ice cream cone. I’m glad I’m not the one who has to choose between an epic giant mech battle and free ice cream. Is your wallet ready for San Diego Comic-Con yet?